Save money during these economically uncertain times by saving water? 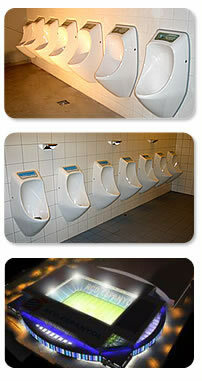 Cut your operational overheads by reducing water wastage through urinal flushing? 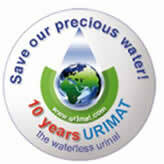 Reduce your carbon footprint by saving water with our Urimat Urinals with their carbon neutral manufacture? Save money and generate advertising revenue at the same time? Save money as well as the environment by using our economical and ecological cleaning product? Replace your harmful chemical cleaners with our biological cleaning product? Help to keep your waste pipes clear with our biological action cleaning product? Use a cleaning product which is Ph Neutral? View photos of our exhibition stand at the 2009 Buy Environmental Trade & Conference Show. Becoming conscious of your impact on the environment does not mean comprise on quality. The public awareness of the opportunities that exist to organisations to contribute to a sustainable environment is rapidly growing, let us discuss opportunities with you now…….